Like many photographers, I enjoy seaside towns in the off-season. Their character changes, along with the light, and they produce more and different kinds of photographic opportunity. This image also puts one in mind of the old adage that the camera never lies. I’m often struck by the way a photo taken in a tropical climate, when skies are overcast, often gives the impression of a temperate place, when in truth the heat and humidity might be overwhelming. No doubt this is due to our own Northern European experiences of conditions that apply when a scene looks thus. In an equivalent way in this photograph, there is a sense of stillness and perhaps a modicum of begrudging autumnal heat, when in reality, on the day, it was bitingly cold and blustery. Cameras create their own stories, and photographs entice us to project. 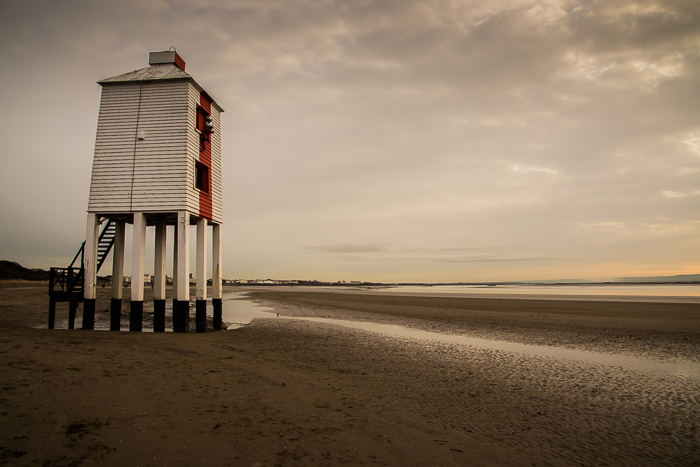 The structure itself is The Low Lighthouse, sited on the beach at Burnham-on-Sea in Somerset. It is one of three in the immediate area. It is of significance, of course, for its unusual square-section, wooden construction, and the fact that it is located as it is. It looks nothing like the round-section, granite lighthouses we are used to, which are normally on clifftops or rocky outcrops in the sea. It dates back to 1832, though, given the way wood rots and the hammerings it must take from the weather and sea spray, one wonders just how much of it is original.